While we initially received funding from North Point Ministries to launch, for the last 12 months Access Church has relied entirely on your prayers and financial support in order to accomplish our mission of leading people into a growing relationship with Jesus Christ. 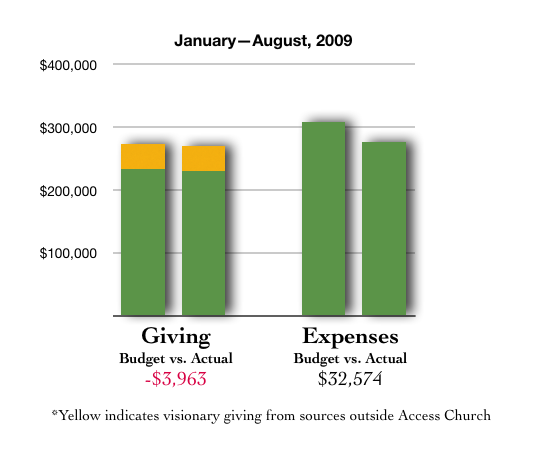 As you can see from the graph to your right, our giving has not yet risen to meet our expenses. We are still heavily dependent upon "visionary giving" from those outside the Access family who believe in our mission. Dramatic progress toward our goal of financial independence has been made in the past several months! Expenses have been dramatically reduced, and more than 85 singles and families support Access Church each month. Thank you for giving to help us reach a point where income consistently meets or exceeds expenses, and ministries can continue unhindered. We're almost there! Thank you for supporting Access Church!